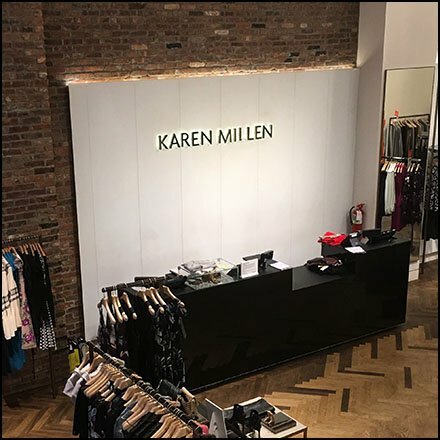 This Karen Millen Flagship Store Counter Branding was distinct from other treatments seen in outlying New Jersey stores. The Karen Miller logotype is always the same, as it should be. The coordination of other elements and materials is up to the designer, and the Karen Miller Communications Policy Manual, if any. Of minor note is that no Registered Trademark Symbol is included. Your thoughts on importance are between you and your legal department. I find (R) and (TM) rather pesky elements of design, but a necessity. This Karen Millen Flagship Store Branding seen in Manhattan.